During his hiatus from competitive golf, Webb Simpson perfected a new grip style and made a comeback to win The Players Championship. He credits his wife, Taylor Dowd Simpson, as being his greatest supporter. Read all about her, right here! The anchored putting stroke was part of Webb Simpson’s winning style, until the PGA banned anchored putters. But that didn’t stop Webb Simpson! He worked hard and took two years to perfect a new grip, which recently won him The Players Championship 2018. During the difficult period, his wife, Taylor Dowd Simpson, helped him cope with the pressure. It has been a trying few months for the Simpson family, and Taylor was a source of strength for her husband. As a result, this couple walked hand-in-hand to claim the TPC trophy. Taylor Dowd Keith is mostly known to her loved ones as a Dowd, and is one of the most beautiful women associated with golfing, thanks to her pro-player husband. She is a native of Charlotte, North Carolina. She was a theater major at Wake Forest University in Winston-Salem when a young golf star from Raleigh joined the university. Taylor’s best friend, Maggie Simmons, knew Webb Simpson, and perhaps felt that her two friends would make a great couple. So, when Simmons heard Webb was going to Wake Forest on the Arnold Palmer Scholarship, she’d tease Taylor that her “future husband” was coming. Taylor and Webb’s love story began at Wake Forest. But they were not college sweethearts right away. Like a Hollywood movie coming to life, Taylor, a sophomore at the time, met freshman Webb’s father at Simmons’ party for the first time. Even though his dad played wingman, Taylor and Webb didn’t actually meet until months later. They started as friends before they began dating. And Sam Simpson held up his end of the deal by paying the $100, which the couple spent on the date! Taylor and Webb’s college romance started pleasantly, but their schedules got in the way. While Webb had his budding golf career, Taylor was busy with theater rehearsals. They managed to make their relationship work around their busy academic activities, but it didn’t last long. Taylor graduated in 2007, but Webb wouldn’t graduate for another year. They parted ways when she graduated and set about her acting career. Taylor was based in Atlanta and Los Angeles, working on becoming an actress. But eventually, they reconnected again. And it really was true love! 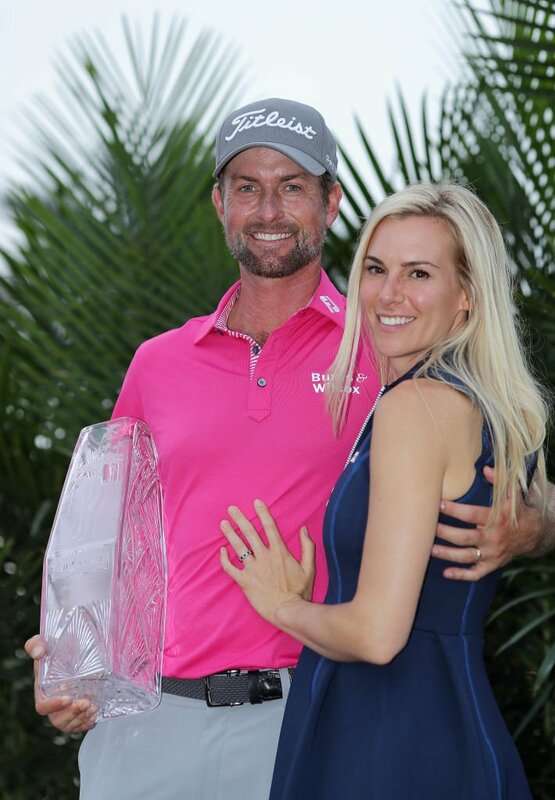 “The first date we had, I thought to myself, ‘I’m falling right back in love with the man I fell in love with my sophomore year,’” said Taylor, who decided Maggie Simpson’s forecast was right and that Webb Simpson was indeed her future husband. According to Taylor, the time apart helped and was a “healthy” step in their relationship. “Then we got back together, and five months later we were engaged, and five months later, we were married,” added Taylor. Taylor and Webb met eight years before he won the 2012 U.S Open. In the two years before his big career win, his personal life was soaring. The couple married in January 2010 at the Quail Hollow Club golf facility in Dowd’s hometown of Charlotte. Their college friends were also in attendance. Since they got hitched, Taylor’s acting career appears to be on the backburner. She’s a devoted golf wife now and is always accompanying her husband on the greens. She was named among the most beautiful golf wives on the tour in 2014. Taylor was the VP of membership for the PGA Tour Wives Association, which helps underprivileged children. She has made TV appearances with her fellow PGA wives regarding the work they do. Webb Simpson has been calling Charlotte home since marrying his wife and they’ve been busy! Taylor gave birth in 2011 to their first child, a boy they named James. 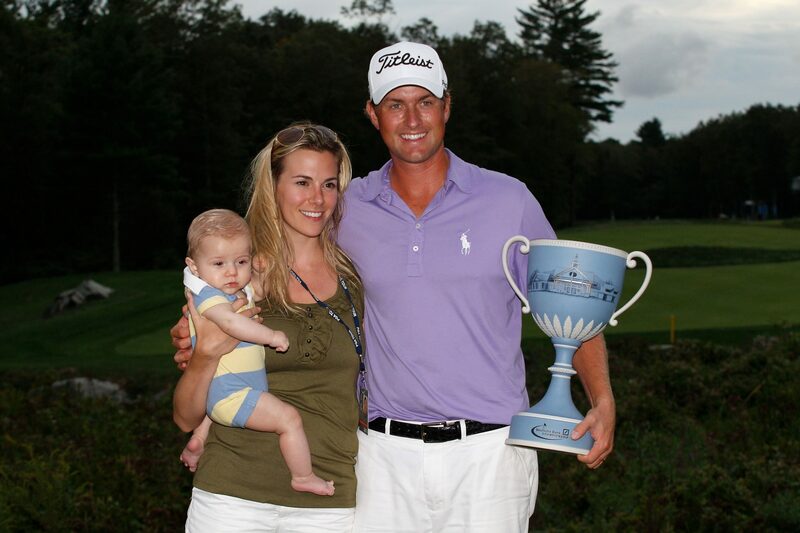 Their daughter, Willow Grace, was born soon after Webb’s U.S. Open win. Golf had a part to play in naming their third child. 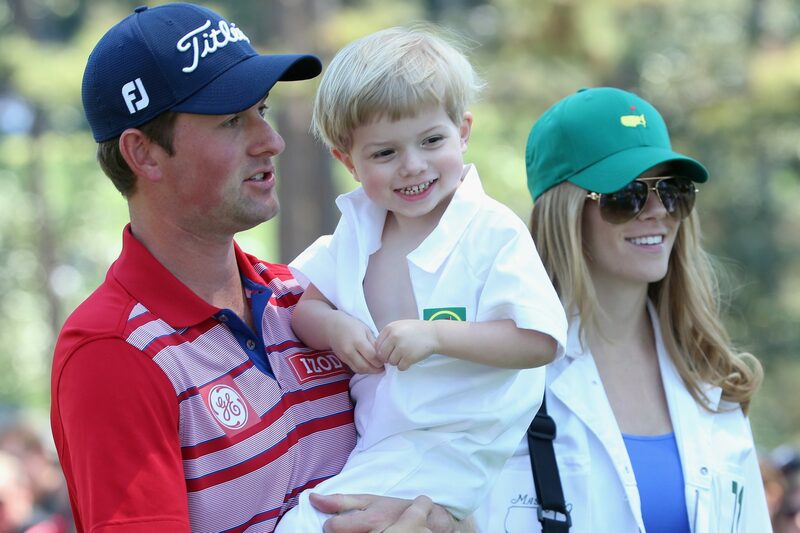 But when Webb Simpson didn’t win the Masters, they scrapped naming their second daughter, Augusta. Instead, they decided to go with Wyndham. Their youngest child, Mercy, was born in May 2016. In addition to being golf wife of the century, Taylor has her own quirky interests. She is a wig collector aside from being a fashionista. She described one of her rock band wigs, which is purple on top and fiery red at the bottom. She also has a pink pixie one as well as a long, black wig. Wigs are a source of fun for Taylor. She’d wear them around the house to play with her kids or out in public, just because she can! The golfer and his wife are outspoken about their Christian faith and the importance it plays in keeping their family together. Taylor and the kids are present at almost every one of Webb’s games. The family spends a lot of time on the road and stay grounded through reading the Bible among many other books. They are also quite active in their community. And the Simpsons also like to have some fun together, whether it’s with Taylor’s wigs or reenacting Webb’s Ryder Cup victory! In the meantime, we’d like to petition that Webb Simpson’s wife start an Instagram account so that we can see some of Taylor Dowd Simpson’s pics of her and her wigs!